Rio de Janeiro, Brazil - LED (light-emitting diodes) street lighting can generate energy savings as high as 85%, an independent, global trial of the technology has found. The program also indicates that citizens of pilot cities prefer LED lighting, citing the social and environmental benefits. The findings of LightSavers, an independent, two-and-a-half-year global pilot of LED lamps in 15 separate trials across 12 cities including New York, London, Kolkata and Sydney, are presented for the first time in a new report entitled, Lighting the Clean Revolution: The Rise of LED Street Lighting and What it Means for Cities: www.TheCleanRevolution.org. The report explores the global market status and potential for LED technology and provides guidelines for policymakers and city light managers who want to scale-up and finance large LED retrofits. The report was launched as part of the Clean Revolution campaign at the Rio+20 UN Global Compact Corporate Sustainability Forum and produced by The Climate Group in partnership with Philips in support of the campaign’s argument that major energy savings can be achieved virtually overnight at relatively little cost. Surveys in Kolkata, London, Sydney and Toronto indicated that citizens prefer LED lighting, with 68% to 90% of respondents endorsing city-wide rollout of the technology. Amongst the benefits that were highlighted in these surveys were a greater sense of safety and improved visibility. The lifespan of LED lighting trialed ranges from 50,000 to 100,000 hours indicating a high return on investment. LED lighting was found to be a durable technology with the need for minimal repairs; the failure rate of LED products over 6,000 hours is around 1%, compared, for example, to around 10% for conventional lighting over a similar time period. The LED market is at a tipping point, with white light LEDs (used in outdoor lighting) at the early stage of the technology curve. Market penetration is accelerating as the market is expected to expand by 60% by 2020. A recent ILO report1 concluded that the green economy could yield up to 60 million jobs; The Climate Group, Philips and partners are calling governments to catalyze the scale-up of LEDs in cities and invest now in order to capitalise on this and create a significant amount of high-value jobs across the world. The LightSaver trial concludes that LEDs are now mature enough for scale-up in most outdoor applications, bring the economical and social benefits to the masses. 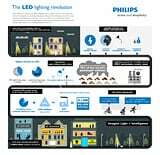 The Climate Group and Philips are calling for an international low carbon lighting standard to be created and implemented ensuring that citizens worldwide have access to energy efficient outdoor lighting. Lighting is responsible for 19% of global electricity use and around 6% of global greenhouse gas emissions2. Doubling lighting efficiency globally would have a climate impact equivalent to eliminating half the emissions of all electricity and heat production in the EU3. And like many other energy-efficient technologies, efficient lighting will boost global prosperity. In the United States alone, cutting the energy used by lighting by 40% would save US$53 billion in annual energy costs, and reduce energy demand equivalent to 198 mid-size power stations4. 3 ‘Homes’ includes CO2 emissions from residential use of gas and electricity. Figures from: IEA, 2011, CO2 emissions from fuel combustion: Highlights. 4 Power stations at 2 TWh of generation each year. Data from Philips Market Intelligence and IEA: Philips (2011) ‘The LED lighting revolution: A summary of the global energy savings potential’, based on IEA analysis. The Climate Group is an independent, not-for-profit organisation working to inspire and catalyse leadership for a Clean Revolution: a low carbon future that is smarter, better and more prosperous. For all. We work internationally with a coalition of companies, states, regions, cities and public figures. We inspire leaders by communicating a compelling narrative for change; we equip them by delivering evidence of success; and work in partnership with them in driving transformative change. Together with our partners, we are building a successful low carbon future of opportunity that boosts economies, creates jobs, enhances energy security, improves the quality of life of communities around the world, and averts the crippling impacts of runaway climate change. Founded in 2004, The Climate Group has operations in Australia, China (Beijing and Hong Kong), Europe, India and North America.